Though all restaurant experiences revolve heavily around eating, so many restaurateurs fail to understand that there’s more to a great restaurant than just good food. From service and general ambience down to the smallest, most pernickety details, the overall experience – from walking through the door to picking up the bill – is everything. Some of the best food I ate last year, for instance, was at a restaurant I actively despised. The culinary skill displayed was exceptional, though the venue’s only redeeming quality. Opened at the end of 2016, Margot is a restaurant that prides itself on experience (namely service) just as much as the quality of food served. At the Drury Lane end of Great Queen Street, between Holborn and Covent Garden, Margot is the first restaurant from Paulo De Tarso and Nicolas Jaouën, having previously worked together at Scott’s in Mayfair. Paulo is on hand during our visit: visiting each table and going out of his way to make all diners feel special. As soon as we cross the threshold, our coats are taken and we’re lead to our table. We sit down and two sticks of grissini arrive, instantly, while we peruse the relatively extensive menu. Waiting staff are friendly and seem delighted to answer questions about the restaurant, specific dishes, specials and wines. They’re also happy to recommend dishes, and make generally brilliant choices. Above all, however, the service is never intrusive and no member of staff visits the table unnecessarily. Alongside the first-class service and the food served, there’s a sense of glamour from a bygone era that’s impossible to avoid falling in love with. 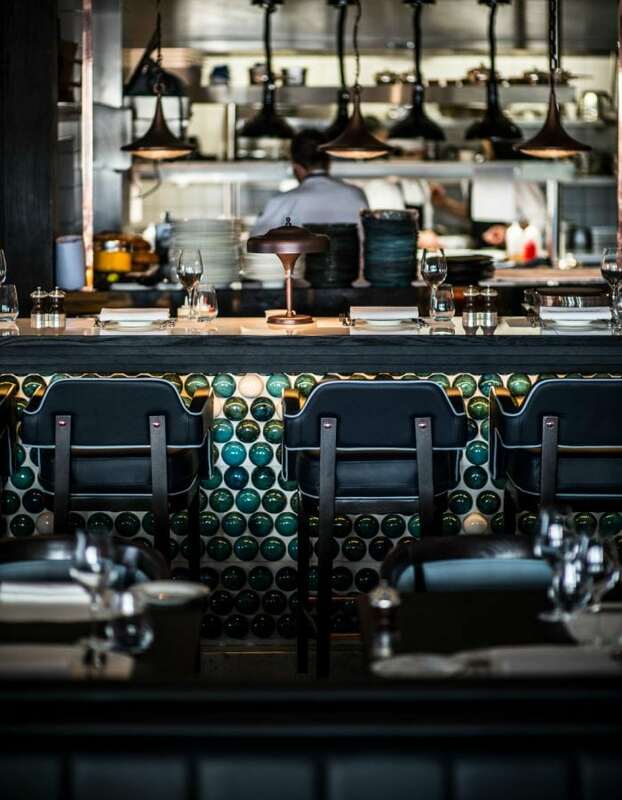 Art deco fixtures are teamed with plush blue leather blanquettes at every table, matching dome-shaped wall tiles, sympathetic lighting, and an open (discrete) kitchen. What’s more, in all of its elegance – the atmosphere is surprisingly unpretentious. As for the food, the menu is created by Executive Chef Maurizio Morelli. With an a la carte selection of over 40 dishes, the menu is divided into tapas-sized plates of Italian salumi or cheese, starters, main courses, pasta dishes, salads, plus an assortment of carpaccios and tartares. What’s more, all of the salads and pasta dishes are available in two sizes – not unlike at The Wolseley. From the raw section, paper-thin slivers of Sicilian prawn are spherically arranged in the centre of the plate and accompanied by raspberries, which are on the tart side. While the raspberries contrast the natural sweetness of the prawn, they threat the overpower their delicate flavour, making this more of a fruit dish than a fish dish. Far better is stewed octopus, comprising chunks of tentacle finished on the plancha grill and served atop a bed of silky chick pea purée. Although difficult to cook well, the octopus is executed perfectly with a soft, pleasing texture, and has a warming richness that renders the dish a fine example of refined comfort food. 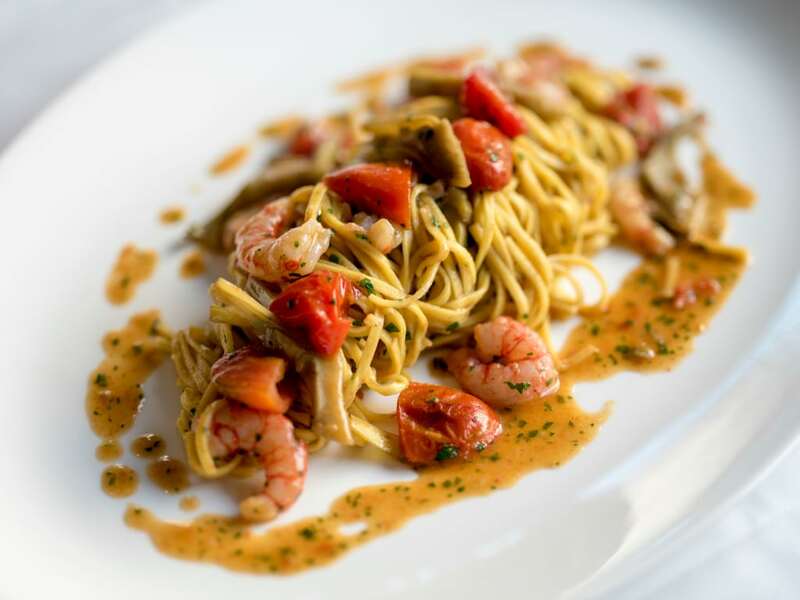 More prawns come with a dish of tagliolini. These Sicilian red prawns are sweet and buttery, in harmony with shavings of globe artichoke and sauce with a subtle ripe tomato base. The pasta has been cooked for a mere 20 seconds longer than desired, but the balance of flavours is outstanding. A substantial dish of venison saddle, is cooked to a perfect medium-rare, sliced and fanned-out across the plate. The meat is wholesome and rich, but without being overwhelming, while a silky smooth pumpkin puree has complementing earthy notes in contrast with glazed chestnuts. From the daily specials on offer, a dessert of Gianduja mousse is beyond comforting. The mousse of hazelnut-heavy chocolate, like the most lavish Nutella, is stacked with biscuit, cherries, raspberries and blackberries. Each bite is the essence of any chocolate-enthusiast’s dream pudding. Flat Sicilian cannolo, on the other hand, is light and refreshing. Thick ricotta cream is sandwiched between two layers of wafer thin pastry. It’s as good as any cannoli I’ve eaten in Italy, though it’s the accompanying rocher of pistachio ice cream that really sets this dish apart. Since opening, Margot has been accused of being expensive. With wine pairings, additional drinks and sides, it is easy for the bill to accumulate. Though starters are somewhat pricey, mains, however, range from the early teens through to a whole sea bass for two (£60) being the most expensive on the menu. The main dishes, in fact, make Margot one of the best value fine-dining destinations in London. With exceptional service and well-executed food – Margot is one of the city’s few genuinely brilliant high-end Italian restaurants. Margot can be found at 45 Great Queen Street, London, WC2B 5AA.